We are pleased to announce that on Tuesday, February 24th, 2015, Family Services of Westchester (FSW), along with more than 100 local dignitaries, supporters and guests celebrated the culmination of a goal set years ago–to bring a state-of-the-art intergenerational facility to White Plains–with a ribbon cutting ceremony at the new Lanza Family Center for All Ages. We are so grateful for your generous support in our capital campaign, which enabled us to reach this exciting moment. Several speakers addressed the crowd prior to the ribbon cutting, including White Plains Mayor Tom Roach, Deputy County Executive Kevin Plunkett, Susan B. Wayne, President/CEO of FSW and Nick Wolff, Chairman of the Board of Directors. Also on hand were Rebecca Lippel, FSW’s Director of the Lanza Family Center for All Ages, other FSW staff and Board members as well as many of our new neighbors, who graciously welcomed us to the community. Following the official ribbon cutting, guests were given an opportunity to tour the facility, including the The Marjorie and Richard Dammann Youth Wing, named after the founders of FSW, and The Sperling Family Adult Wing. Those in attendance, including many of the donors whose support enabled this project to succeed, were impressed by the care that was taken in designing a facility to meet the unique needs of each population. As Susan Wayne remarked at the event, “Our only regret is that Pat Lanza, whose $1 million challenge grant enabled us to embark on this project, did not live to see her vision become reality.” Mrs. Lanza passed away in March 2014. The Center, modeled after My Second Home, FSW’s award-winning intergenerational program in Mt. Kisco, will bring children, teens and seniors together at one site to participate in programs, share experiences and benefit from one another, just as they would in a family setting. Programming at the center will include adult day services with caregiver support, early childhood education, and a home base for FSW’s many youth development programs. Importantly, the Center will include spaces where the diverse age groups will interact during planned intergenerational activities as well as through informal encounters throughout the day. Together, children, teens and older adults will enjoy gardening, sharing meals, singing songs, cooking side-by-side, and participating in special events that allow them to break down age barriers and form lasting impressions and enrich each other’s lives. The Ribbon Cutting ceremony was also the perfect time to launch the latest phase in our fundraising efforts, the Buy-A-Brick Campaign. We welcome you to visit our website for detailed information about the campaign and encourage you to invest in FSW’s path to the future by purchasing a piece of the path to the Lanza Family Center for All Ages. Now that the ribbon is officially cut, we invite you to come visit the new Center for All Ages! We are happy to arrange a private tour and would love for you to see our incredible new space. To arrange a visit please contact Courtney Rabb, Vice President for Development and External Affairs, at 914-305-6836 or crabb@fsw.org. Lifetime Arts project, Creative Aging in NY State Libraries: A Regional Model with National Applicability is putting on the following two events that are public readings by older adult participants who took part in sequential writing workshops. Students learned the craft of memoir writing, exploring both prose and poetry forms. Participants were encouraged to explore his or her past experiences and creatively express them through their writing. The teaching artist led interactive lectures and writing exercises in a supportive and collegial environment. With models that come from classical mythology, the lessons in this course involved the active use of memory as a tool for memoir writing. Participants learned creative elements to encourage and enhance their own story or myth while finding their individual voice through the writing process. Yonkers on the Move (YOM), a community walking campaign: promoting a healthier lifestyle one step at a time for all ages, recently signed up to walk in the Yonkers Step Out: Walk to Stop Diabetes. YOM is inviting you to walk with us in the fight against diabetes. Join us Saturday September 28 at Tibbetts Park in Yonkers. Step Out is so much more than an event. It’s an opportunity to change the future and make a positive impact in the lives of those who are affected by diabetes. Throughout the country and in Yonkers the rates of persons including young children with type 2 Diabetes is increasing. Will you join Yonkers on the Move in their quest to prevent and cure diabetes once and for all? Chances are, you also know someone who has been affected by diabetes and you already know how important it is to stop this disease. We walk for all of those who are affected by diabetes! By joining team YEDIYOM, you will help the American Diabetes Association provide community-based education programs, protect the rights of people with diabetes and fund critical research for a cure. The power we have together far outweighs what I can do alone. It only takes a few steps to help make YOM’s steps go further! Please join me by using the link provided – it would mean so much to us! P.S. If you are unable to walk with us, will you make a donation to support our efforts? Please use the links provided and thank you in advance for your help! Matters of the HeART: Supporting Creative Aging Through the Arts is the theme of the 7th annual visual arts exhibit by Westchester County seniors 55 and older. This year’s show will feature paintings, drawings, mixed media creations, collages, photographs, and free-standing sculptures. After May 6th, portions of the exhibit will then move to the Andrus-on-Hudson Retirement Community in Hastings where it will remain for three weeks. Juried portions of the show will also be on display at Fordham University’s Harrison Campus from June 3rd thru June 15th. A free, opening reception will take place Sunday, March 17th at Greenburgh Town Hall. The handicapped will be granted early admission to the building at 1 pm, and the general public will be admitted from 2-4 pm. The reception will feature live music and refreshments. The Andrus-on-Hudson opening reception will be held Tuesday, May 17th, from 3-5 pm. The Fordham University opening reception will take place Wednesday, June 8th from 3-5 pm. 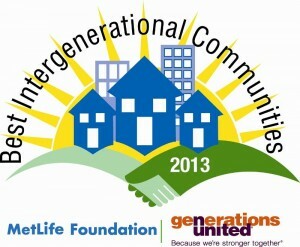 Westchester named a Best Intergenerational Community by MetLife & Generations United! They’re places that folks of all ages proudly call home because they recognize the benefits of intergenerational programs, practice, policies and services. 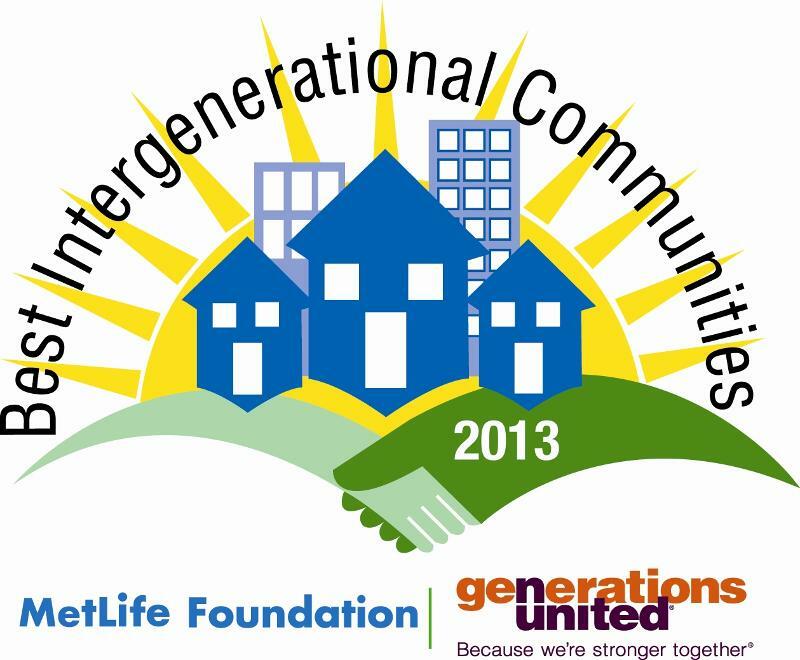 Please join us in applauding the recipients of the 2013 MetLife Foundation/Generations United Best Intergenerational Communities Award: Dunedin, Fla; Montgomery County, Md. ; Itta Bena, Miss. ; and Westchester County, NY. Awards ceremony will take place in Washington, DC on March 21. Westchester County, NY – MetLife Foundation and Generations United proudly announced today . Westchester County, NY has been selected to receive one of four MetLife Foundation/Generations United America’s Best Intergenerational Communities Awards. The awards are designed to heighten awareness of the importance intergenerational solidarity plays in building strong, supportive communities. The other award recipients are the communities of: Florida; Montgomery County, Maryland; and Itta Bena, Mississippi; Two other communities were named finalists: Chanute, Kansas and Proctor, Minnesota. Fellow judge Pam Smith, Director of Aging & Independence Services for the County of San Diego, added, “The MetLife Foundation/Generations United awards go to four remarkable and robust localities who demonstrate every day that intergenerational collaboration helps sustain and extend the quality of community life.” San Diego County was a recipient of one of the inaugural MetLife Foundation/Generations United Best Intergenerational Communities Awards last year. Presentation of this year’s awards will take place March 21 at the Cannon House Building, Room 122 on Capitol Hill in Washington, DC. The Best Intergenerational Communities awards program was made possible with a grant from MetLife Foundation. About Generations United: Formed in 1986, Generations United is the national membership organization focused solely on improving the lives of children, youth, and older people through intergenerational strategies, programs, and public policies. Generations United serves as a resource for educating policymakers and the public about the economic, social, and personal imperatives of intergenerational cooperation. For more information, visit gu.org. Family Service Society of Yonkers (FSSY) and JCY-Westchester Community Partners (JCY-WCP) have announced the merger of their respective Yonkers-based nonprofit organizations. Building upon wide community support, FSSY and JCY-WCP are joining forces to expand their programs and serve an increased number of individuals and families throughout Westchester County. JCY-Westchester Community Partners will become a major division of FSSY. “JCY-Westchester Community Partners, Westchester County’s leader in intergenerational literacy volunteer programming, and Family Service Society of Yonkers, a major provider of a range of human services, including home health care and diverse family supports, are coming together to build on the synergistic effect of their organizational strengths,” announced Stanton C. Selbst, Board President of JCY-Westchester Community Partners. “Our two organizations, having complementary missions and having worked together for many years, believe that this important step will result in the increased impact of our respective programs, as well as in greater administrative efficiencies, among other advantages,” added Thomas J. McSpedon, Board President of Family Service Society of Yonkers. According to Janice Lubin Kirschner, Executive Director of JCY-WCP, each organization will retain its identity and programmatic leadership in their respective areas of focus, while combining their operations. JCY-WCP’s Holocaust Remembrance and other Jewish programs will continue as they have in years past. Importantly, JCY-WCP will remain the contact point for the Yonkers’ Mayor’s Advisory Committee on Jewish Affairs. The staff of JCY-WCP will relocate to 30 South Broadway in Yonkers, the site of FSSY’s administrative offices, in the near future. JCY-Westchester Community Partners, which was founded in 1919, currently works to enhance the educational experience of children in Westchester County through effective learning initiatives and the engagement of volunteer mentors. Family Service Society of Yonkers has served Westchester County for 130 years. Its mission is to be the premier provider of human services through a range of programs focusing on home health care, diverse family supports, guardianship and advocacy for individuals and families, which will enhance their quality of life. On behalf of the board and staff of the Helen Andrus Benedict Foundation, I invite you to the November educational and networking meeting of the Helen Andrus Benedict Foundation. The meeting is scheduled on Tuesday, November 6th from 9am to 12noon at the Hudson River Museum in Yonkers. A buffet continental breakfast will be served. There is no fee for the meeting, but to help with our planning, please RSVP no later than Friday, October 26th. Harry (Rick) Moody, Ph.D is our keynoter, and I think you will find him a provocative and inspiring speaker. He will talk with us about changes in the meaning of life as we grow older, about aging and spirituality, and leaving a legacy. Also, Dr. Moody will tell us about AARP’s new initiative, Life Reimagined, a tool to help mid-life and older people figure out what’s next and to imagine what’s possible in terms of exploring careers, starting a business, volunteering, and learning. Dr. Moody started his career as a school teacher in Harlem where he also taught ESL (English as a Second Language) and high school equivalency courses. He is a graduate of Yale and earned a PhD in philosophy from Columbia University. Currently he is Director of Academic Affairs for AARP in Washington, DC, as well as a Senior Associate with the International Longevity Center-USA and Senior Fellow of Civic Ventures. Dr. Moody served as National Program Director of the Robert Wood Johnson Foundation initiative, Faith in Action, and was Executive Director of the Brookdale Center on Aging at Hunter College in New York City. He is known nationally for his work in older adult education, and recently stepped down as Chair of the Board of Elderhostel. He is author of many books and articles, among them, The Five Stages of the Soul, which has been published in seven languages. In addition, we are inviting several of your colleagues to respond to his presentation from their Westchester perspectives. These include Eridania Camacho of The Gateway Center and G2E at Westchester Community College in Valhalla, Rose Hines of WorkSearch, Margaret Jessup, a GrandPower Advocate, and Alisa Kesten of the Volunteer Center and RSVP. Want to learn about some ways you, and the mid-life and older people with whom you work, might approach the later chapters of life? Come join us on the 6th! We look forward to welcoming you to the meeting. P.S. November 6th was the only date Dr. Moody could be our speaker on a pro bono basis. He will be in meetings in New York City that week, he lives in Colorado, and he works one week a month in Washington DC. As you know, and we are painfully aware, November 6th is Election Day. Please be sure to vote before or after the meeting! The newly formed Yonkers Diabetes Education Initiative(YEDI) and Yonkers on the Move(YOM): A Community Walking Campaign are participating in the Step Out: Walk to Stop Diabetes. Team YEDIYOM would like to invite you to walk with them at Mercy College on Sunday September 30 to walk. Step Out is so much more than an event. It is our opportunity to change the future and make a positive impact in the lives of those who are affected by diabetes. Please join us to prevent and cure diabetes once and for all. Chances are, you also know someone who has been affected by diabetes and you already know how important it is to stop this disease. By walking in Step Out, you will help the American Diabetes Association provide community-based education programs, protect the rights of people with diabetes and fund critical research for a cure. The power we have together far outweighs what anyone can do alone. Please join YEDIYOM by visiting our team site. P.S. If you are unable to walk with us, will you make a donation to support our efforts? Please use the team site link, and thank you in advance for your help! Mt Kisco, August 20, 2012. The Boxwood Alliance (www.theboxwood.org) offers a free aging in place resource for older adults and their families in Northern Westchester and Putnam Counties. The idea for both the website and the not for profit organization emerged from a group of professionals in the area who work with older adults, including an elder law attorney, a long term care insurance planner, a geriatric care manager, a nurse executive, and others. They had met in a geriatric coalition and decided to put their combined resources and information together in one place. Catherine Wynkoop of Pound Ridge helped to get the process started and is now the board chairman. This fall, the Boxwood Alliance is coordinating Active Aging Week across upper Westchester and Putnam Counties during the week of September 23- 29. “We are reaching out to all the older adult programs and services across the region to join in celebrating the wealth of choices for remaining actively engaged,” said Wynkoop. The Boxwood Alliance will feature these local events on its website and will promote them across the region. Agencies and organization that wish to be included can reach the organization by email at: info@theboxwood.org or by calling 914-764-3014.